If you haven’t already heard of Evan Bouchard, it won’t be long before you do. 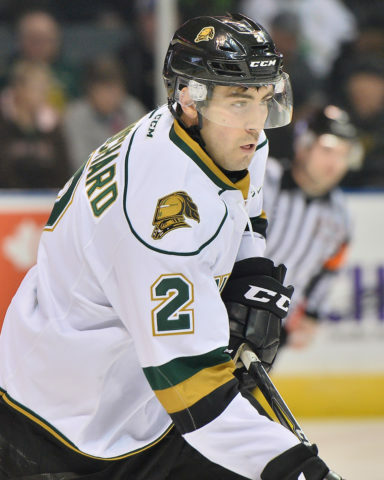 A member of the guard with the Ontario Hockey League’s London Knights, Bouchard is playing in his third season with the storied franchise and will be looked upon to take on a different role this season – one of leadership. 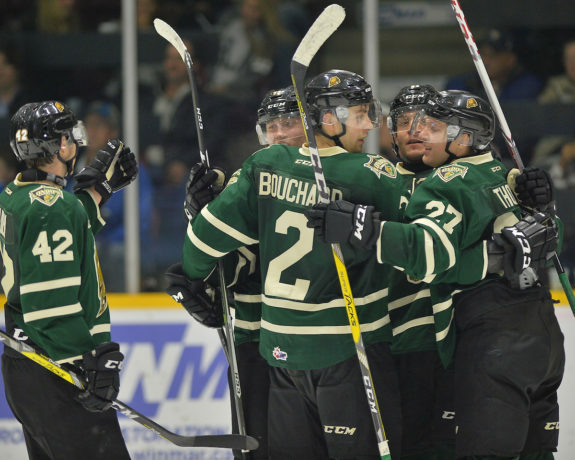 When Bouchard came to the Knights, the team was on the verge of something special. He landed with London for the 2015-16 season after the Knights drafted the big defenceman with the 17th overall pick in 2015 from the Oakville Rangers Minor Midget team. In his rookie season with the Knights, Bouchard played in 43 games during the regular season and collected two goals and 17 points. He added two assists in 10 playoff games as the Knights earned themselves the J. Ross Robertson Cup as OHL Champions before taking down the competition on their way to the Memorial Cup win as well. That team was comprised of players like Christian Dvorak, Mitch Marner and Matthew Tkachuk among others – a cast anyone could recognize as special. And he learned. The 2016-17 season marked the next step in Bouchard’s OHL career. He played 68 games for the Knights during the regular season and tallied 11 goals and 44 points. He added seven points in 14 postseason games, while the Knights were eventually ousted by the Erie Otters in seven games. Still, Bouchard showed just how valuable he could be to the organization and they responded. The 2017-18 season started for the Knights with a number of changes on the blue line. Olli Juolevi was at camp for the Vancouver Canucks and Victor Mete with the Montreal Canadiens. The team traded Nicolas Mattinen to the Flint Firebirds, which left Bouchard as the head of the Knights’ watch on the back end. 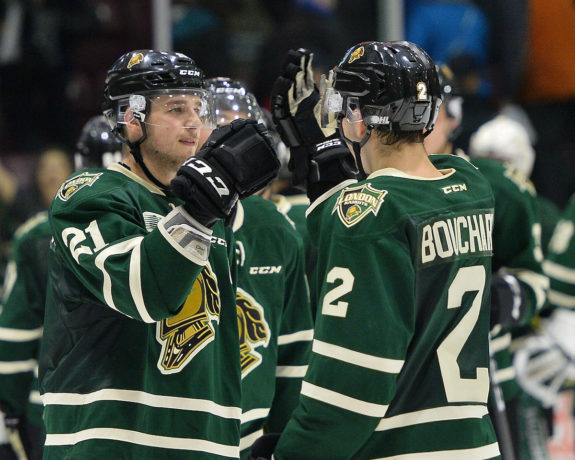 A quarterback on the team’s power play and with every visible on-ice cue indicating a leader in the making, it’s clear that Bouchard is understanding of his new role with the Knights. And thus far he’s proved capable of taking on that leadership role. Off the ice, he leads by example – adding a quick bike workout after games. On the ice, he continues to try to mentor younger players in the art of Knights’ hockey as others did with him. Either way, Bouchard has a big year ahead of him – with the NHL Draft looming and his name being mentioned as a first-round pick. With a late birthday, Bouchard just missed out on the 2017 NHL Draft. But the 2018 Draft won’t end without Bouchard hearing his name. Right now, he’s listed among the top 20 for the upcoming draft. At 6-foot-2 and just under 200 pounds, it’s understandable why the versatile defenceman is being looked at as a possible first-round pick. So what does the 17-year-old have to do to maintain that draft stock? Bouchard’s been able to develop within one of the most successful organizations in the OHL with the backing of staff like Dale Hunter. While it’s surely not the only reason he’s being looked at as a first-round pick, he does recognize the importance of donning the Knights’ logo. “Knowing it’s such a successful organization, it’s good just to be a part of this success and to take in as much information as you can from these great coaches and great staff,” he said. There’s no telling how the season will go for the 2017-18 version of the London Knights. Nor is there any way of predicting how well Bouchard will play, but if his OHL career to this point is any indication, it won’t be long before you’re hearing his name on one of the prospect lists of an NHL club.